Before discussing the solar eclipse itself, it is important that it is clear to you what an eclipse is. An eclipse is known as the astrological moment in which one planet is shown in the shadow of the other. This brings along several spiritual consequences that we will discuss in different articles. There are eclipses of the sun or of the moon and some of them are visible to the human eye, others are not. This is due to the geographical limitations that we have from the Earth. Much is being said about the solar eclipse and the lunar eclipse. But how do they happen? First of all, it is important to know that the Earth and the Moon are stars that move in line in the solar system. The Earth realizes its return of one day around itself, whereas the Moon rotates, in relation to the Earth, a turn of 27 days. The solar eclipse happens when, in these continuous motions, the Moon is in perfect alignment between the Earth and the Sun. Because of this alignment, the sun’s rays arrive in a different way – eclipsed – to the Earth. 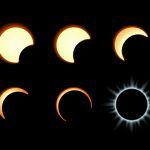 Solar eclipse: what is the difference to the lunar eclipse? When an eclipse is predicted, you hear about it all over the media and among your friends, family and co-workers. Actually everyone around you is talking about it and you will certainly be discussing it as well. This is due to the fact that an eclipse, either from the sun or from the moon, is such a beautiful and also very rare astronomical event. But there are always some doubts about the difference between the lunar eclipse and the solar eclipse. Many people still think that both are the same event, but with different names. The process by which eclipses is formed is generally described as the alignment of the stars. In this case, the alignment of the Sun, the Earth and the Moon. As the Moon, our natural satellite, revolves around the Earth, often both are aligned with the Sun. This can create either the solar or the lunar eclipses. The solar eclipse will be formed when the Moon is in the middle of the Sun and the Earth. On the other hand a lunar eclipse occurs if the Earth is in between the Sun and the Moon. This type of eclipse happens when the Moon, in perfect alignment with the Sun and the Earth, manages to cover the great totality of the solar rays. This creates a sudden darkness during the day. This phenomenon causes confusion even in the animal kingdom, where nocturnal animals end up coming out of their lairs. Partial solar eclipse occurs naturally at several points and we often are not informed about them. This type of eclipse happens when the Sun, the Moon and the Earth are aligned, but not perfectly. This creates a very natural shadow, where hypotheses of eclipses are discarded. It is a very common type of eclipse and does not interfere with terrestrial life. This last type of solar eclipse is the rarest one. It is rare not only to have the perfect alignment of the Moon with the Sun, but also by the distance of the Moon from the Earth. In the annular solar eclipse, the aligned stars have in their midst the Moon farther from the Earth and, as it is aligned with the Sun, the vision of the eclipse comes to us as a ring. This effect is quite beautiful and it is much appreciated by all observers. It is rare in the southern hemisphere.